A lot gets me choked up lately. Maybe it's all the time I spend alone. Maybe it's all the daytime TV. Or maybe it's just the bronchitis that spontaneously erupted in my chest. I do always cry when I'm sick. Regardless, I couldn't help but get a little emotional yesterday when I was standing at the intersection of Atlantic Avenue and Court Street in Brooklyn, staring at an open manhole surrounded by a few orange cones. I'd stood at that intersection in 2002, underestimating the number of people who would show up for an art installation by Ars Subterranea in an abandoned underground train tunnel, and was told there was no way I was going to get in. There were people lined up as far as the eye could see, seemingly down each side of each of the four spokes of the intersection. Looking at that open manhole, I knew I was missing out. I found out last year that the Brooklyn Historic Railway Association had started doing tours (apparently, again) of the Atlantic Avenue Tunnel, which they tout as "the world's first subway tunnel," but every month, something prevented me from going. Either I was travelling for work or I found out too late about it or the reservation list was full, and every month I suffered the pangs of missing out like I first experienced with the tunnel six years before. The BHRA took the winter off but they're back on schedule and I finally booked a tour of the Atlantic Tunnel, which can only be accessed through said manhole in the middle of a busy Brooklyn intersection. Once I finally got there, I wondered how many more of these urban archaeological excursions could possibly be on my Bucket List? At one time in my life, as I crossed an item off, another one would be added, but now I seem to be making my way more quickly down the list than I'm adding to it. Maybe I'm just preparing to maybe leave New York when my lease is up in August. Or maybe I've one-upped myself so many times that there just aren't that many more activities that could trump the prior one? The Atlantic Tunnel certainly trumped our tour of the abandoned City Hall station, and our visit to the Brooklyn trolleys last summer (which were rebuilt and restored by the same guy who rediscovered the Atlantic Tunnel in 1980, Bob Diamond). And not just because it's harder to get into and because I've been trying for nearly seven years. Or maybe that is why. When Bob Diamond first cracked open the manhole cover in 1980 (well, actually it was the gas company), it led to a four-foot drop filled with loose, sandy dirt. Bob knew there must be more to it than that so he used his feet to feel around and submerged himself in the dirt, finally finding a wall that he broke through, leading into the infamous tunnel that, at the time, no one was really sure even existed. (It was falsely reported that it had been destroyed, but it was actually only sealed off in order to save money.) Bob had been warned of poisonous gas, flooding waters, and maneating rats, but what he actually found was a half-mile long tunnel made of Manhattan bedrock and red brick, stained black by the steam trains that once ran through it. The dirt from under the manhole was pitched through the hole in the wall and now supports a wooden staircase that you have to climb down into the tunnel. Crawling through the hole in the wall - its edges still jagged from when they first burst through - felt like when I used to lock myself out of my Newell Street apartment all the time and would have to break in through the window. Except on the other side this time, it was dark, dank, wet, dirty, and deep. There are a few incandescent bulbs that light the way, but mostly you're led by your own flashlight, which doesn't always catch the unevenness of the ground below or the rubble that's scattered about. The left side of the tunnel still shows the impressions of the train tracks that once lie there, but the right side has been smoothed out by the horse-drawn wagons that trotted alongside the trains in the tunnel's later years. I kept looking for traces of human (or even animal) life, but all I saw were bricks and a wheelbarrow. It's strangely preserved down there, unlike a lot of abandoned sites that have fallen prey to vandalism or construction. At places like the NYS Pavilion or Bannerman Castle you usually find folding chairs and barbeque kettles among wooden two-by-four's and tool chests. But down in the Atlantic Tunnel, it's just dirt, and the slightest cool breeze that chills you colder as you advance deeper towards the other sealed end. You think about the rumors of dead bodies behind the walls and the spirits of workers who may have perished there. It's not deep enough for the bends, but who knows what ailments might befall a construction worker using the cut-and-cover method (inspired by the Old Croton Acqueduct)? And he may finally get those trolleys up and running on a brand new Brooklyn above ground rail system. I've got to say, I'm pulling for the guy. He's trying to avoid regret too. Lots of further reading at the BHRA website. Click here to see Ziggy's story about his White House Easter Egg Roll performance and some photos I took during the shows. I can never really enjoy things in the moment. I’ve always got my eyes on the next thing. On my way to a concert, I can’t wait to get there. When I get there, I can’t wait to get home. During nearly every trip I take, I can’t wait til I can get back to NYC and move on to the next thing. I just spent a week in Washington D.C., though, and was living pretty in-the-moment. I didn’t pressure myself to see all the touristy sites, but rather enjoyed staying in Amanda’s nice house and keeping an eye out for her cat and dog, who woke me up with a lick-in-the-face in the morning and bid goodnight by jumping on my bed and rubbing her head into my comforter. Working from Amanda’s home seemed better than working from my cramped apartment, where the sound of animals usually comes from the mice in the walls. I had no real impression of it and didn’t have much desire to be a tourist, but since I was going to be alone rather than shown around by friends, I had to get a little proactive in terms of planning things to do. There would be no Rodeo Bar around the corner. No Marshall Stack a bus ride away. And I knew that even with the animals’ company, I would be stir crazy enough to have to go out, even if that meant spending the day in the center city, going back to Brookland (an hour away) to feed the munchkins, and then going back into the city for a couple of hours before catching the Metro before it stopped running or finding a cab that I could direct to the near northeast suburbs. Fortunately, it doesn't take much to entertain me. A wine bar in Dupont Circle. A massage. Trying new beer at The Big Hunt with a new drinking buddy. On my way back from the Govinda Gallery’s Bob Marley photo exhibit in the rain, stopping and snapping a photo of the stairs featured in The Exorcist, which look less ominous now that they’ve added a railing to the precarious and fall-inducing non-walled side of it. Although DC was unseasonably chilly and sometimes downright cold, I caught the cherry blossoms past peak but still in bloom, framing the Jefferson Memorial and catching the sunlight as they inevitably dropped from the low branches to the ground with each passerby. I’m not one much for monuments – obelisks and pyramids and giant statues of political figures – preferring instead historical usable spaces like train stations, cathedrals, and factories, so I didn’t bother to walk up to the Washington Monument, though I caught a good look at it from afar. I found out later that you can climb up into it. That’ll be something to do for the next trip. All of these pit stops, though, were peripheral to the real reason I was in town: for Ziggy Marley’s headlining performances at the White House Easter Egg Roll, a popular event on the south lawn attended annually by 30k people. I missed Fergie’s performances, though I could hear the last one from outside the SE Gate. 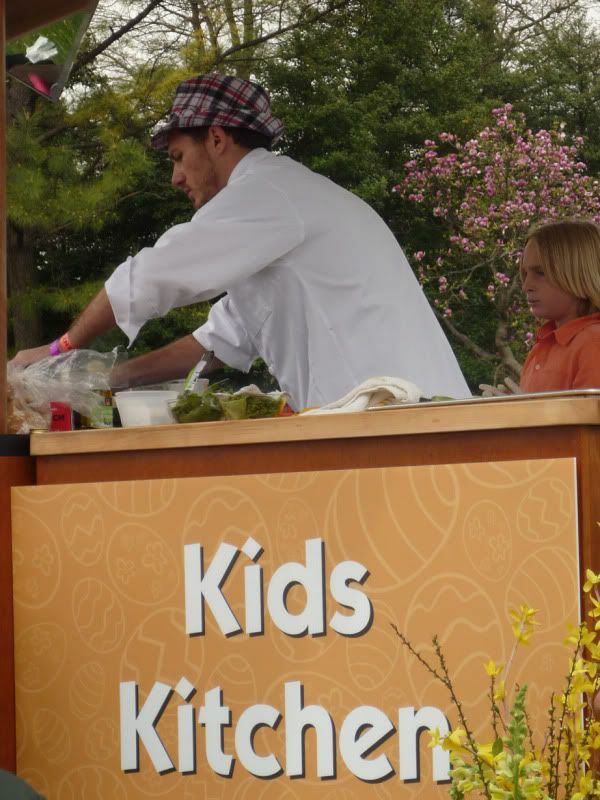 I caught the end of a kids’ cooking demo by Top Chef’s Spike, who apparently has a burger joint on the hill which I didn’t find out about until it was too late to go. I stood in front of actor James Cromwell, who holds a special place in my heart as the farmer in Babe. I even got a free commemorative wooden egg, only given out to children under 10 and available for sale on the White House website. Once I got there, I realized I didn’t really need to be there for my consulting gig, but I was so happy to be welcomed by three generations of the Marley family and to witness first-hand how much a lot of people would love to be in my shoes. All ages and races reached over the fence that I was behind to get a photo with Ziggy, even just on their camera phones. They asked for photos with Ziggy’s mom Rita, who they recognized immediately (I did not). Even one of the PBS Kids costumed characters reached into a furry pocket to retrieve a camera, and leaned over and whispered into Ziggy’s wife’s ear, “That’s Ziggy’s kid, right? Can I have a picture?” Truly one of the most bizarre fan moments of my career. By the time Tuesday morning came, I was ready to go back to NYC. I needed something to make me miss it. But give me a day or two back and I’m sure my wanderlust will kick in again…. Since I'm relatively choosey about what I write here, and I try to portray vignettes as opposed to random thoughts, I thought that Twitter might be a nice supplement to this blog. And since I'm past the age when I can wake my friends up late at night with my observations or consternations via text message, at least I know that Twitter will receive them gladly and will always be awake for me. If you do such things, you can follow me on Twitter at http://twitter.com/avoidingregret. You'll find all the things you find interesting about Avoiding Regret, but in instant gratification form. I've been wearing the same eye makeup and hairdo since Saturday. Not the same style, mind you - I just haven't washed any of it off. I spent the entire month of March in the city, working out of my apartment, trying to find a daily excuse to shower and put on my contacts. But now that I'm on a bus somewhere between Baltimore and Washington, DC, wearing freshly laundered clothes that don't smell of the restaurant I live above, leaving a snowy April behind me, I'm ready to scrub myself clean. Leave all traces of New York City behind me while I spend a week in our nation's capitol. The Dianne Brill mascara has finally started to chip away, and its tube technology is leaving little chunks along my dark circles and cheekbones. I keep trying to flick it off with my fingernails but keep accidentally pulling out my eyelashes. I'm ready to get off of this bus and walk amongst the cherry blossoms.